If you go online and search for products that are compatible with your Alexa, you’ll be inundated with thousands of results for everything from light switches to coffee makers to security cameras. However, if you search for Alexa-compatible smart clocks, your options are limited: you can either go with Amazon’s pricey Echo Dot for $130 or dig through clunky, unattractive knockoff products. 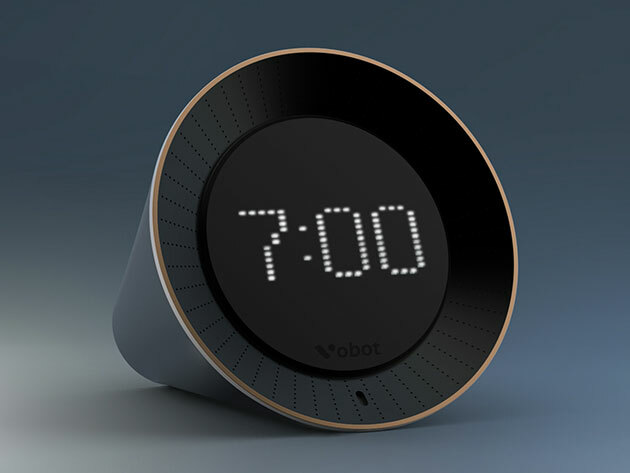 The Vobot Smart Clock fills the smart clock niche with a sleek look and effortless compatibility. The Vobot combines Amazon Alexa, sleep coaching, and daily routine reminders into one small package. Its smart alarm wakes you up in the morning with upbeat tunes that gradually increase in volume — making you less “alarmed” when you start your day. Need some extra z’s? Just flip the clock over to activate the snooze function (or hold the screen to turn it off if you decide to play hooky from work). Tap, talk and gesture controls let you play music through your connected playlists, listen to the news, check the weather and more throughout the day. When you’re ready to drift off, the Vobot’s white noise and hypnotic sounds can help lull you into a restful slumber. Usually, the Vobot sells for $59, but right now it’s just $44.99 — 23% off the retail price, and 80% cheaper than Amazon’s Echo Dot.